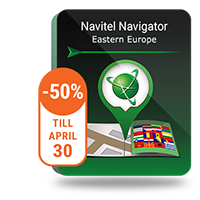 Europe Q1 2019 maps are now available to the users of Navitel Navigator. Q1 2019 map update is available for the following 44 countries: Albania, Andorra, Austria, Belgium, Bosnia and Herzegovina, Bulgaria, Croatia, Cyprus, Czech Republic, Denmark, Estonia, Finland, France, Germany, Gibraltar, Great Britain, Greece, Hungary, Iceland, Isle of Man, Italy, Latvia, Liechtenstein, Lithuania, Luxembourg, Macedonia, Malta, Moldova, Monaco, Montenegro, Netherlands, Norway, Poland, Portugal, Romania, San Marino, Serbia, Slovakia, Slovenia, Spain, Sweden, Switzerland, Ukraine, and Vatican City State. The map of Austria contains 26 738 cities and settlements, of which 10 783 include address search. The map contains 54 243 POI. Total length of the road graph is 216 095 km. The road network of Vienna and Linz was revised and updated. The map of Bulgaria contains 5 518 cities and settlements, of which 608 include address search. The map contains 31 500 POI. Total length of the road graph is 93 746 km. In Q1 2019 release detailed maps with address search were added to the following cities and settlements: Dobrich, Gabrovo, Obzor, Razgrad, Sandanski, Stara Zagora and Veliko Tarnavo. The map of Bosnia and Herzegovina contains 6 642 cities and settlements, of which 16 include address search. The map contains 3 686 POI. Total length of the road graph is 133 621 km. New part of a highway connecting Prnjavor and Johovac was added. The map of Croatia contains 6 794 cities and settlements, of which 1 780 include address search. The map contains 30 435 POI. Total length of the road graph is 77 608 km. New bridge was added between the city of Trogir and Čiovo island. The map of the Czech Republic contains 20 535 cities and settlements, of which 6 259 include address search. The address search includes 3 792 184 unique addresses. The map contains 125 804 POI. Total length of the road graph is 161 222 km. part of the Kosatka detour. The map of Hungary contains 3 821 cities and settlements, of which 3 212 include address search. The map contains 35 245 POI. Total length of the road graph is 108 812 km. part of M35 highway (Berettyóúfalu-Debrecen). The map of Finland contains 13 816 cities and settlements, of which 9 511 include address search. The map contains 15 358 POI. Total length of the road graph is 479 970 km. In Q1 2019 release detailed maps with address search were added to the following cities and settlements: Iisalmi, Kuusamo, Nurmes, Ylivieska. Signposts marking turnoffs have been added to E8, E18, E75, E63, 6, 13, 14, 9, 79, Keha I, Keha III, Lahdenväylä, Porvoonväylä, Turunväylä highways. Thanks to our users’ reports road graph in Etelä-Karjala, Kainuu, Kymenlaakso, Lappi and Pohjois-Karjala was updated. Due to the extensive work of the department of cartography and geodesics office as well as meticulous analysis of the messages from Navitel Navigator users, NAVITEL® releases a large-scale update of the map of France. The map of France contains 68 292 cities and settlements, of which 35 766 include address search. The address search includes 17 822 566 unique addresses. The map contains 1 202 222 POI. Total length of the road graph is 1 253 630 km.. The address database was completely updated for the whole territory of France. The buildings are displayed on the map for easier navigation. The road network of Paris and other metropolitan areas was revised and brought up-to-date according to the latest information from the Federal Address Base. The POI database with service information was updated accordingly. Detailed road network as well as POI database was revised and added to the following regions: Auvergne-Rhône-Alpes, Bourgogne-France-Comté, Brittany, Centre-Val de Loire, Corsica, Grand Est, Hauts-de-France, Île-de-France, Normandy, Nouvelle-Aquitaine, Occitanie, Pays-de-la-Loire and Provence-Alpes-Côte d'Azur. The map of Germany contains 97 048 cities and settlements, of which 88 798 include address search. The map contains 1 647 560 POI. Total length of the road graph is 1 100 835 km. Road network in the Eastern part of Germany was updated. The map of Italy contains 69 233 cities and settlements, of which 39 840 include address search. The address search includes 31 403 699 unique addresses. The map contains 67 972 POI. Total length of the road graph is 780 700 km. The road graph was updated according to our users’ reports and comments. The map of Moldova contains 1 646 cities and settlements, of which 187 include address search. The map contains 25 321 POI. Total length of the road graph is 45 713 km. petrol station POIs in Leuseni and Nemţeni. The map of Montenegro contains 785 cities and settlements, of which 56 include address search. The map contains 4 205 POI. Total length of the road graph is 8 785 km. The map of the Netherlands contains 6 291 cities and settlements, of which 5 994 include address search. The map contains 21 147 POI. Total length of the road graph is 154 278 km. New 3D objects were added to the map of Amsterdam: Amsterdam ArenA, Hermitage Amsterdam, Oude Kerk, Rijksmuseum and Van Gogh Museum. The map of Norway contains 18 811 cities and settlements, of which 1 438 include address search. The map contains 6 238 POI. Total length of the road graph is 222 870 km. All up-to-date information on speed cameras and speeding limits was added to the following cities: Bergen, Elverum, Haugesund, Stavanger and Trondheim. Names of the tunnels and bridges in these areas were added to the latest map. The updated map of Poland 730 372 km of road graph, 267 870 POI, 95 313 settlements, 55 063 of which are provided with the detailed street network and support address search. The address search includes 14 486 898 unique addresses. In comparison with the previous Q3 2018 map release, the road length has been significantly increased with more than 4 500 kilometres added to the map of Poland. The address database of all cities and settlements was revised. POI database was updated. The map of Portugal contains 15 604 cities and settlements, of which 2 824 include address search. The map contains 6 941 POI. Total length of the road graph is 210 948 km. Road network of Portugal was updated. The map of Romania contains 14 483 cities and settlements, of which 272 include address search. The map contains 39 536 POI. Total length of the road graph is 134 685 km. part of A10 highway (Turda-Aiud). The map of Serbia contains 16 576 cities and settlements, of which 800 include address search. The map contains 23 279 POI. Total length of the road graph is 59 162 km. New part of A1 highway was added next to the Q1 2019 map of Serbia. The map of Spain contains 43 701 cities and settlements, of which 23 820 include address search. The map contains 724 132 POI. Total length of the road graph is 779 709 km. Road network of Spain was updated. All up-to-date road information on speed cameras and speeding limits was also included into the following highways: E4, 13-Sjöbovägen, 25, 31, 32, 50, 52, 56-Bergslagsvägen, 70, 100, 127- Glömsjö, 155, 255, 269, Älvbrovägen, Riksvägen, Stockholmsvägen, Tågarpsvägen, Ysanevägen (Solvesborg). The map of Ukraine contains 30 013 cities and settlements, of which 3 529 include address search. The map contains 127 483 POI. Total length of the road graph is 1 140 136 km. 862 streets in Kiev, Kherson Lvov and Sumy Oblasts were renamed. New release includes 11 new settlements available for house-level search: Berezne, Dubrovytsia, Horodenka, Lebedyn, Novoiavorivsk, Ripky, Skhidnytsia, Tavriysk, Tlumach, Tysmenytsia, Vynnyky. Road network has been updated in 57 towns and settlements in the oblast of Chernihiv, Kiev, Kharkiv, Kherson, Lvov and Poltava. Important! Please note that the maps of the Q1 2019 release work with Navitel Navigator version 9.10.1996 onwards.